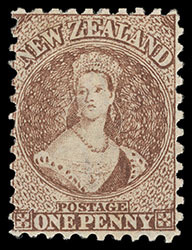 New Zealand, 1871, Queen Victoria "Chalon Head", 1d brown, perf 10, Large Star watermark, o.g., small hinge remnant, nicely centered, bright color and paper, tiny thin spot, fresh and Very Fine appearance. Scott No. 38. Campbell Paterson No. A1n. SG No. 126 £1,100 ($1,440). 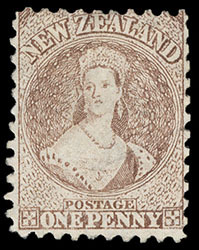 New Zealand, 1871, Queen Victoria "Chalon Head", 1d brown, perf 10, diagonal plate scratch left side (R. 20/1), Large Star watermark, nicely centered, worn impression with bright color and paper, fresh and F.-V.F. Scott No. 38 var. Campbell Paterson No. A1n. SG No. 126 var. £1,100 ($1,440). 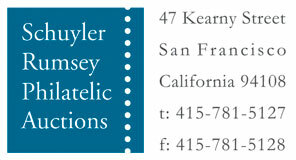 Yeroc, J.M.A. 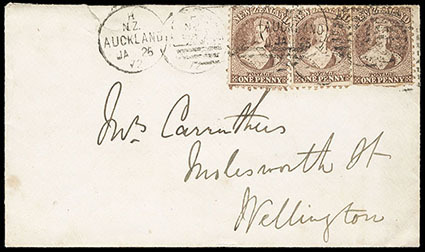 Gregson, January 2000, lot 661; with 1988 Holcombe certificate. Scott No. 38. Campbell Paterson No. A1n. SG No. 126 Estimate $200 - 300. References: Illustrated in Odenweller as fig. 10.2, p. 157.